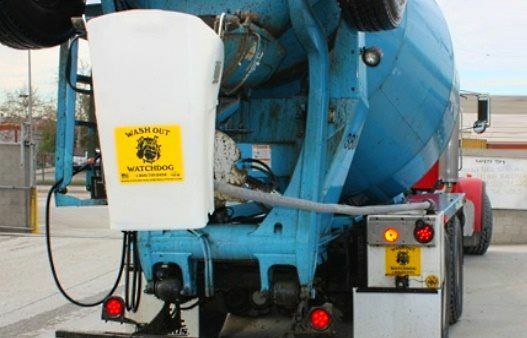 The Washout Watchdog is a premiere chute washout system for ready mixed concrete trucks. It is comprised of a molded, heavy duty bucket that the driver hangs on the end of the chute at the beginning of the rinse down process on a job site. 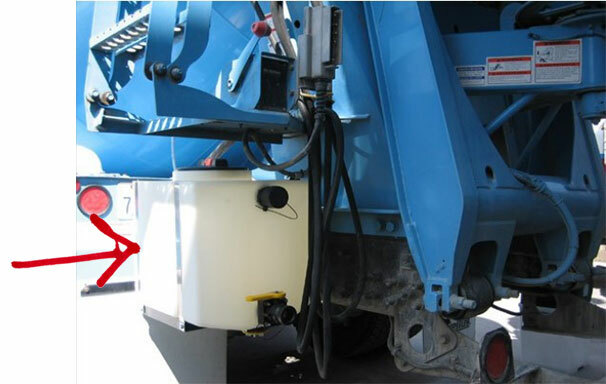 When the rinse down process is complete, the driver lifts the chute, attaches a hose to the bucket, opens the valve, and transfers the washout water by gravity to a tank that is attached to the truck. The water and materials are then returned to the plant for recycling. It is an affordable, lightweight, highly durable system that is gravity fed and works great in extreme heat or cold. Our tanks are also insulated to prevent the water from freezing. No pumps or air lines are needed and it is very reliable. Each unit is designed to provide full containment of all washout materials. 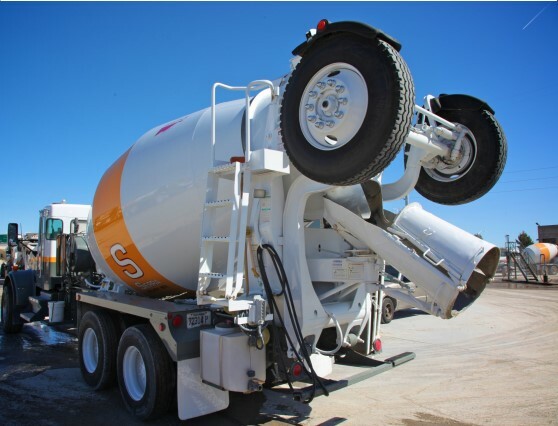 We have several models that fit both front and rear discharge mixers. 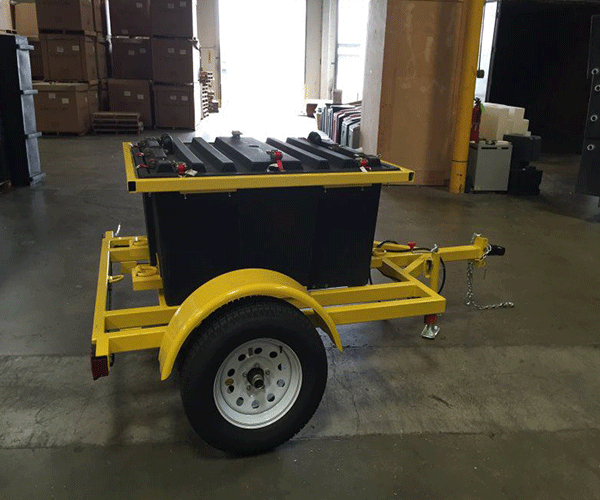 Our standard tank mounted under the ladder and the bucket rack mounted in front of the fender is one of the most common configurations. It requires 13 inches of frame rail for the bracket and a total of 24 inches for the tank. This is a great place to mount the standard tank. It is in an area that is easily accessible and yet inconspicuous. 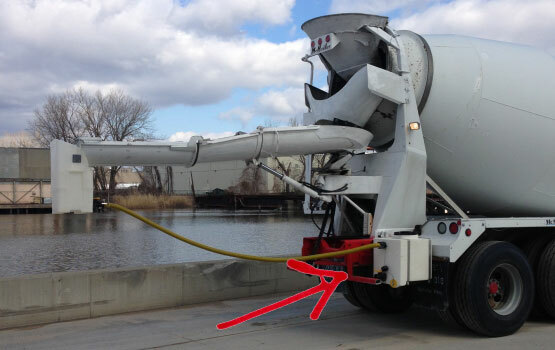 The standard tank and Bucket rack are both mounted on the passenger side of this mixer. 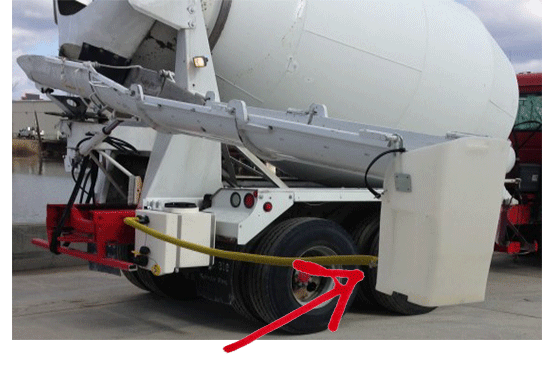 This makes it easy for the driver to use and maintain the unit. Mounting the bucket rack just in front of the fender is one of the most popular mounting locations for the bucket rack. 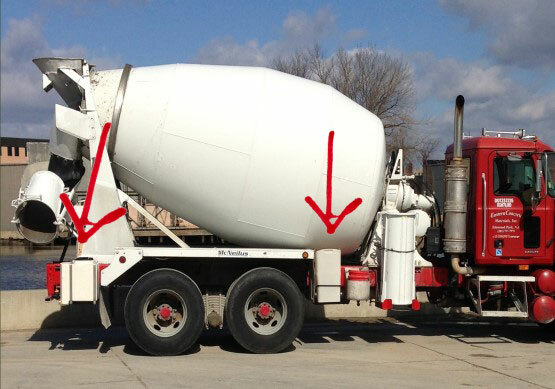 If possible, we suggest mounting the bucket on the driver’s side, but there are times when this is the best option. Depending on the chute and water tank configuration. Above: Washout Watchdog Gravity-Fed Chute Washout System in use with one chute on. Below: With two chutes on, pull it closer to the tank side.